To gain access to this system, you must first unlock the Automatic Sprite Battle System. A guide for that you can find HERE. Your Manual Sprite Battle System is now also unlocked. When you reach level 31 and your Sprite has reached level 2 (has a body), Master Nanco in the Sprites' Forest (294 660) has a special quest for you: "L31. Sprite Skill Acquisition". As part of this quest, you will receive your very first Skill Points (2 Novice points)! You can find the new "Sprite Skills" button in your Sprite Window under "Details". Clicking this button will open your Sprite's Skills window. 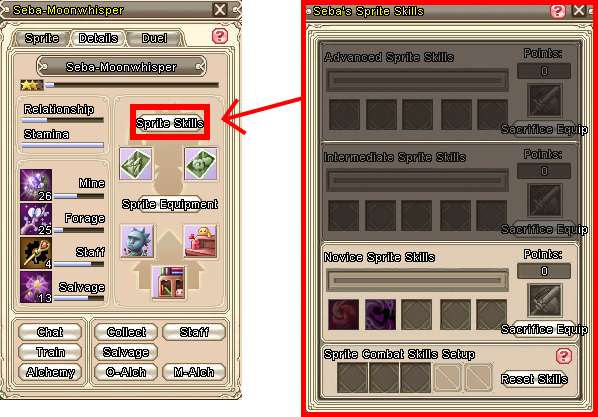 After unlocking each level (novice, intermediate, avanced), the sprite will automatically acquire 1 to 2 skills. More skills can be learned by acquiring them from certain mobs. There are 2 ways to acquire Skill Points. Second way is to sacrifice equipment and fill the experience bar. Each filled bar grants you 1 Skill Point. To do so, certain equipments can be sacrificed. 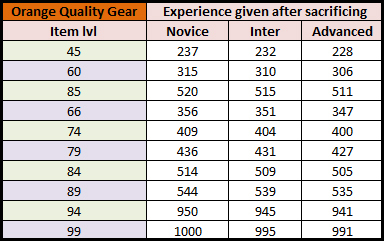 The stronger the equipment, the more exp will be gained. But beware, sacrificing a piece of equipment will destroy this piece and it can not be restored! Each skill, be it novice, intermediate or advanced, can reach a maximum lvl of 5. Leveling a skill will increase the effects that skill does. After your skill has at least one level, it can be used on the Sprite Combat Skills Setup. Remember that your Sprite can only learn 5 Skills per level so if you ever don't want a skill anymore, use the "Forget" option by right clicking the skill. Keep in mind that the Skill Points used to level the skill you want to forget will not be returned. So now you have leveled your skills but how do you use them? Let's start by summoning your Sprite! Once you are in Auto Mode, left click your fierce Sprite's image to get into the brand-new skill mode! The button on the right lets you decide if you prefer looting or combat to have priority. You can combine all skills so they fit your fighting style but remeber, you will have to actively use these skills as your Sprite does not use them on his own! 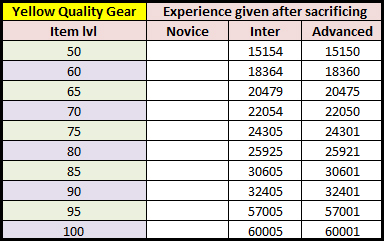 Just to remind you, each skill, be it novice, intermediate or advanced, can reach a maximum lvl of 5. Default skill that can also be obtained from Nanco. The bonus for each of the 5 levels of that skill is also shown. Physically damages target; has 15/16/17/18/20% chance of stimulating Blood Heal. Blood Heal restores 1000/1500/2250/3000/4000 HP to the unit being attacked by the target. Target also receives "Combo Ready - Basic" state. Cause magical damage to a single enemy target with 20% chance to trigger Slowing Curse. Slowing Curse reduces target movement speed by 20/25/30/40/50% and lasts for 5/5/6/6/7 seconds. Cause physical damage to a single enemy target with 10/11/12/13/15% chance to knock back target 15m. If target has the "Combo Ready - Basic" state, target is always knocked back 15m and also slowed by 20% for 3 sec. Target also receives "Combo Ready - Intermediate" state. 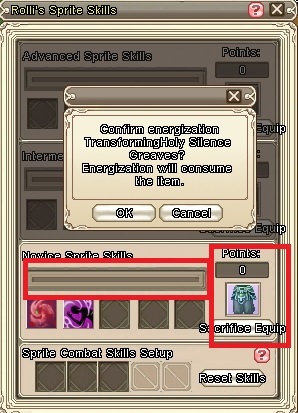 Cast sprite blessing on own character to receive All resistenace +50/60/70/85/100 points for 10 sec. Players may only receive one intermediate blessing at a time. Cast sprite blessing on own character to receive an energy shield which can absorb 10000/12500/15000/20000/25000 damage points for 10 sec. Players may only receive one expert blessing at a time. Sprite skills that are currently obtainable, others than those obtainable from Nanco, are presented in the list below. 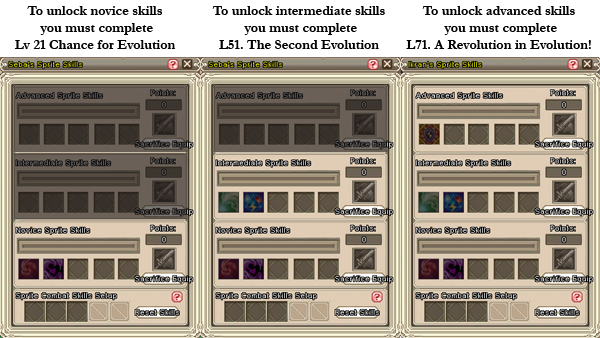 The bonus for each of the 5 levels of that skill is also shown. Cause Physical Damage to a single enemy target with 15/16/17/18/20% chance to trigger Magic Heal. Magic Heal restores 500/700/900/1200/1500 EN to the unit being attacked by the target. Cause Physical Damage to a single enemy target with 20% chance to trigger Crippling Hit. Crippling Hit reduces target evade by -10/12/14/17/20% for 5/5/6/6/7 sec. Cause Physical Damage to all targets within range and also Movement Speed -25/30/35/40/50% for 3 sec. 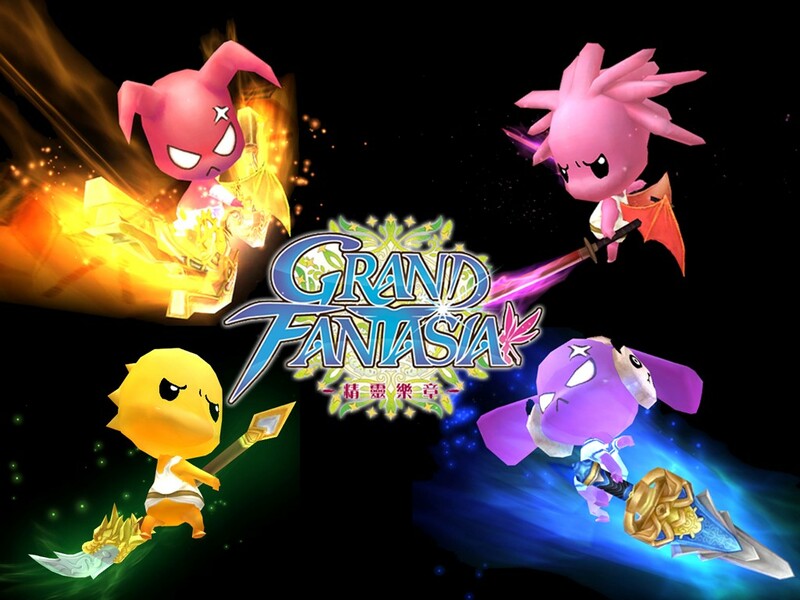 Cast sprite blessing on own character to receive Cast Cost -50/60/70/70/100 EN for 20 sec. Players can only have one intermediate sprite blessing active at any time. Cause Physical Damage to a single enemy target with 20% chance to trigger Friendly Support. Friendly Support causes damage taken +1/1.5/2/2.5/3% to target. Stacks up to 5 times and lasts 15 sec. If target has the "Combo Ready - Basic" state, always trigger Friendly Support effect and damage taken +6%. Cast sprite blessing on own character to receive immunity to unconsciousness and Movement Speed +5/10/15/20/25% for 5/6/7/8/10 sec. Players can only have one advanced sprite blessing active at any time. Cause Physical Damage to a single enemy target with 20% chance to cause Sonic state to the target's current opponent. Sonic effect gives Attack Speed, Cast Speed and Movement +3/3.5/4/4.5/5%. Stacks up to 5 times and lasts 15 sec. If target has the "Combo Ready - Intermediate" state then Sonic status will also add Movement Speed +15% for 10 sec. You can obtain them from monsters in Sorrow Peninsula, Glazefrost Mountains and Dreamer's Plateau. Skills obtainable from <Sprite Combat Skill Chest>, from random daily rewards system. Physically damages target; has 20% chance of causing Blinding Hit status. Blinding Hit status decreases hit rate by 10/12/14/17/20% and lasts for 5/5/6/6/7 seconds. Magic Adepts target; has 20% chance of causing Becalming Curse status. Becalming Curse status decreases attack and casting speed of target by 15/18/21/25/30% and lasts for 5/5/6/6/7 seconds. Magic Adepts all targets within a set radius; increases damage by 5/6/7/8/10% for all friendly targets in range and lasts for 5/5/6/6/7 seconds. Increase the player's movement speed by 10/12/14/17/20%. Physically damages target; has 10/11/12/13/15% chance of causing Wounded status. Wounded status decreases damage caused by 8/10/13/16/20% and lasts for 5/5/6/6/7 seconds. If the target has "Combo Ready Intermediate" status you must add Wounded status before increasing damage received by 10%, last for 8 seconds. Physically damages target; has 10/11/12/13/15% chance of causing Mirrored status. Mirrored status reflects 10/12/14/17/20% of all damage and lasts for 5/5/6/6/7 seconds. If the target has the status of “Combo Ready Intermediate,” attach protective shield to absorb 3000 points of damage. Just like the automatic system, manual system also allows some skill combos to be achieved. Some Novice level skills can induce the status "Combo Ready - Basic" on the target. Some Intermediate level skills have an extra bonus, if they are used when the target is in "Combo Ready - Basic" status. Some Intermediate level skills can induce the status "Combo Ready - Intermediate" on the target. Some Advancedlevel skills have an extra bonus, if they are used when the target is in "Combo Ready - Intermediate" status. Mind if I translate it for the french forum ? "Dans un monde trop souvent gouverné par la corruption et l'arrogance, il est souvent difficile de rester fidèle à ses convictions philosophiques et littéraires."